A 48-mile segment of the Little Pee Dee River recently became the state's newest State Scenic River. In June 2005, a bill sponsored by state Rep. J.E. Hayes of Dillon officially designating the Little Pee Dee River in Dillon County as a State Scenic River was ratified by both houses and signed by Gov. Mark Sanford. The ninth Scenic River to be designated in South Carolina is located in Dillon County between the Marlboro County line and the Marion County line. 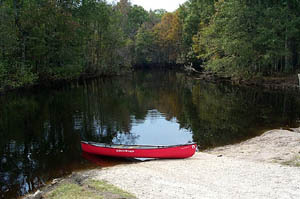 The Little Pee Dee River is a wonderful example of a blackwater river shouldered by a ribbon of undisturbed swamp forests and white sandbars at low water levels. This ribbon of wild and undeveloped land adjacent to the river provides high quality habitat for a variety of plant and animal species including some rare, threatened and endangered species. A year ago, the Friends of the Little Pee Dee in Dillon County requested that the S.C. Department of Natural Resources (DNR) study this river for inclusion in the Scenic Rivers program. In Fall 2004, DNR staff initiated an eligibility study of the Little Pee Dee River in Dillon County. Public meetings held in January 2005 revealed significant local interest for conserving the unique and outstanding resources of the Little Pee Dee River, and resolutions supporting the designation were adopted by the Dillon County Council. Following the signing of the bill, the process of organizing a community-based resource management plan begins. Through the River Conservation Program, DNR will form a Scenic River Advisory Council to guide the future vision of the river. This council, chaired by DNR staff, will be made up of people who live in the local community and represent a cross-section of river-related interests. A majority of the council will be river-bordering landowners. "The goal of the Scenic Rivers Program is the conservation of South Carolina's unique and outstanding river resources," said Dr. Barry Beasley, DNR Habitat Protection Section chief. "This program provides a means for landowners, local citizens, and community interest groups to come together, identify critical river-related issues, and develop a management plan to help maintain the natural character and beauty of the river for future generations."